Croatia has the largest population of Lipizzaner horses in the world, about 15-16 %. In 2007 Croatia had more than a thousand Lipizzaners, out of 6000-7000 in the world. Croatia has more than 200 years of tradition of organized breeding of Lipizzaners. Opisan kao „jedan od najboljih europskih novinara i publicista“, nizozemski pisac Frank Westerman posjetio je sredinom velja;e 2011. Hrvatsku radi predstavljanja i promocije svojih knjiga „Inženjeri duše“ i „Ararat“ koje su prevedene na hrvatski. Tom prilikom 19. veljače posjetio je i Lipik gdje je bio zadnji put 24. lipnja 2008. godine, istog dana kada je Lipik posjetio i Nenad Bach. Razlog ponovnog posjeta Lipiku je upravo izdana njegova najnovija knjiga pod nazivom „Dier, bovendier“, nažalost zasada samo na nizozemskom, o kretanju i stradavanju lipicanaca kroz povijest tijekom ratnih događanja u kojoj jedan bitniji dio zauzima i priča o lipičkim lipicancima tijekom Domovinskog rata tj. najstariji lipički pastuh Conversano Batosta 53 (rođ. 1987.). Prilikom ovog posjeta posebno ga je zanimao upravo pastuh Conversano Batosta 53 rođen 1987. godine kao jedan od dva najstarija živuća pastuha lipicanske linije Conversano u svijetu koja svoje korijenje vuče od davne 1767. godine. Hrvatsko izdanje knjige o lipicancima očekuje se u proljeće 2012. godine a Frank Westerman još jednom je potvrdio mogućnost da će predstavljanje knjige možda biti u Lipiku! U seciranju najvažnijih dijelova knjige napomenuo je da njegovo dijelo sadrži opise kretanja i selidbi lipicanaca po Europi tijekom oba Svjetska rata, dok je završni dio knjige priča o Lipiku i agoniji lipičkih lipicanaca, njihovom putu u neizvjesnost i konačno povratku u matične štale nakon dugih 16 godina. Naposljetku, Frank Westerman je predao donaciju za udrugu Latica tj. projekt terapijskog jahanja za djecu u potrebi. Donaciju (2.000 kuna) su zajednički prikupili Frank Westerman i nizozemska čitateljica Judith Alberts koja je željela pomoći razvoju jahanja u Lipiku. Posjet Franka Westermana organiziran je pod okriljem udruga Inora, Novi Lipik i Lijepa naša-grana Lipik. Described as “one of the best journalists and publishers in Europe”, the Dutch author Frank Westerman, visited Croatia in the middle of February 2011 in order to present and promote his books “Engineers of the Soul” and “Ararat” that were translated into Croatian. He took this chance to visit Lipik on February 19th where he was the last time on June 24th, 2008, the same day Nenad Bach visited Lipik. The reason for his repeated visit to Lipik is his just published book “Brother Mendel’s Perfect Horse”. The book is about the Lipizzaner horses throughout history during an act of war. The story about the Lipizzaner horses of Lipik, that is, the oldest stallion in Lipik Conversano Batosta 53, during the Croatian War of Independence takes an important part in the book. During his visit he was especially interested in the stallion Conversano Batosta 53 that was born in 1987 as one of two oldest and still living stallions of the Lipizzaner horse breed Conversano in the world. This horse breed has its roots back in 1767. The Croatian issue of the book about the Lipizzaner horses is expected to be published during spring 2012. Frank Westerman confirmed once again that there is a possibility that the book may be presented in Lipik! While he was analyzing the most important parts of the book, he mentioned that his work contains descriptions about the movement and the relocation of the Lipizzaner horses across Europe during both world wars. The last part of the book talks about Lipik and the agony of the Lipizzaner horses of Lipik, their way into uncertainty and final return into the home stall after 16 long years. In the end Frank Westerman handed over a donation to the organization Latica for a project where children with special needs have the possibility to therapeutically ride horses. Frank Westerman and a Dutch reader, Judith Alberts, who wanted to support the development of horseback riding in Lipik, collected the donation of 2.000 Kuna (approx. 370 US-Dollar). The visit of Frank Westerman was organized under the aegis of the organizations Inora, Novi Lipik and Lijepa naša of the sector Požeško-Slavonska. 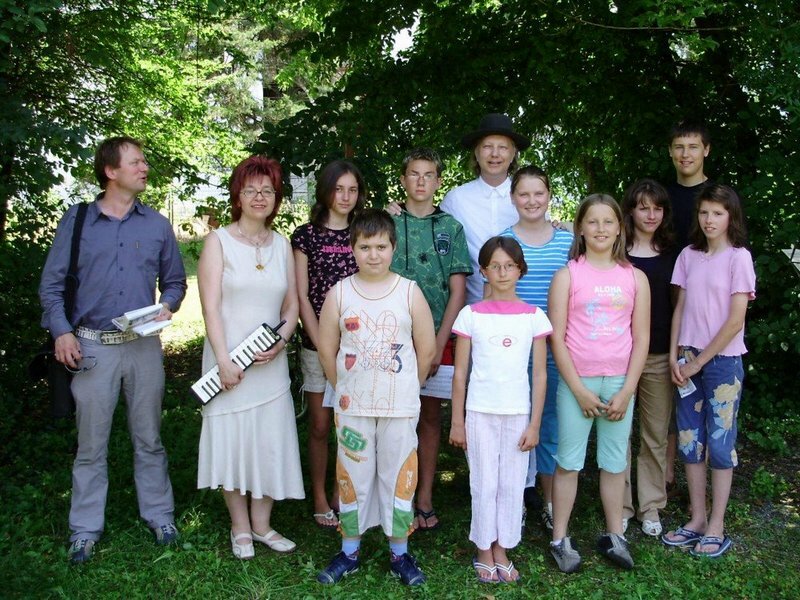 Frank Westermann on the left and Nenad N. Bach in white shirt in Lipik with Children's Choir, June 2008. Ana Novokmet, Tamara Prohaska, Danijela Prohaska, Vedrana Cah, Timotej Prohaska and Zvjezdana Cah. 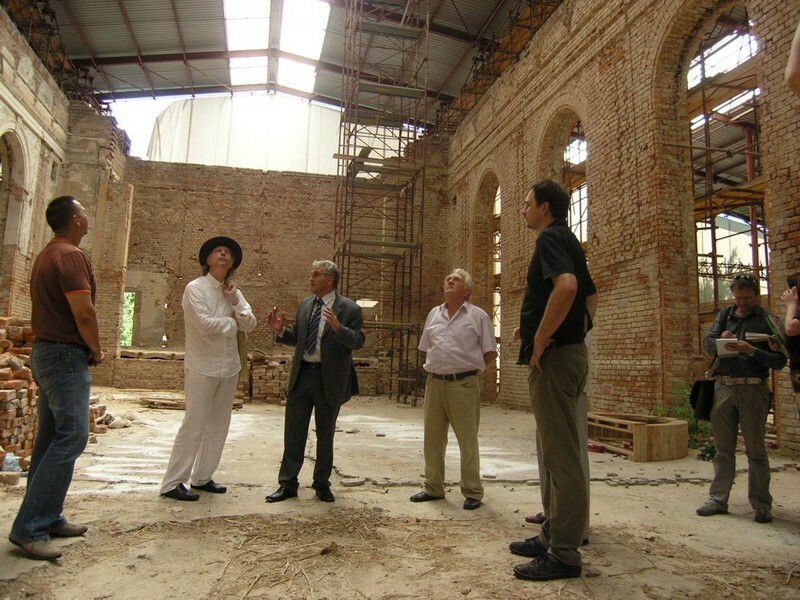 former mayor Stjepan Horvat, and Frank Westermann taking notes on the right, June 2008. Looking at Kursalon destroyed in 1991 during the Serbian aggression on Croatia. 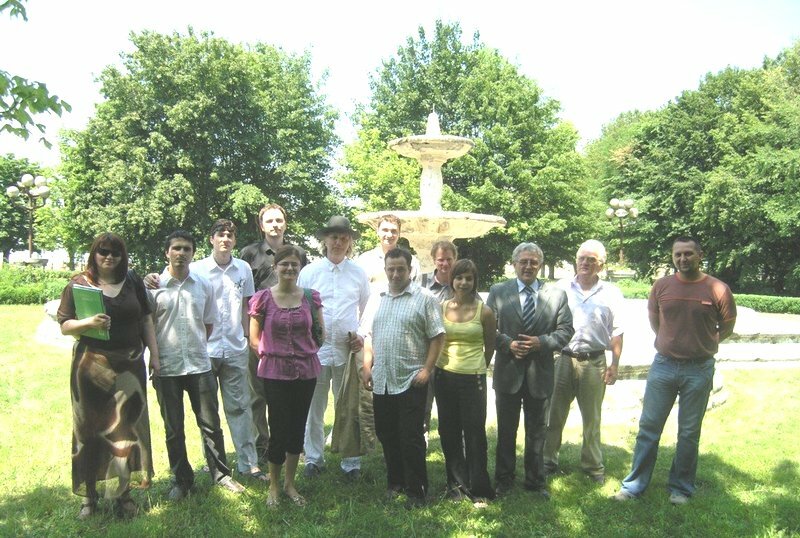 Frank Wstermann fifth from the right, in the central park in the town of Lipik, in front of Kursalon, June 2008. Nenad N. Bach with his hat, Ivan Pušćenik is left to him. The above three photos by the courtesy of Nenad N. Bach, source nenadbach.blogspot.com . Nenad N. Bach talking to Frank Westermann at the end of this video. In 'Brother Mendel's Perfect Horse' (Dier, bovendier), a leading role is reserved for a legendary Lippizaner stallion that played in feature films and Shakespeare productions. “When you touch a Lippizaner,” Frank Westerman was told as a child, “you are touching history.” Now, as writer-narrator, he explores the history of this unique creature. Following the pure bloodlines of the studbook he reconstructs the story of four generations of “imperial steeds” as they survive the fall of the Habsburg Empire, two world wars and the insane breeding experiments under Hitler, Stalin and Ceausescu. What begins as a fairy tale ends up as a chronicle of the quest for racial purity. The reader is carried across Europe, from imperial stables and stud farms to the controversial gene labs of our day. If animal breeders are so good at genetic engineering, why do attempts to perfect the human strain always end in tragedy? 'Brother Mendel's Perfect Horse' is a modern fable in which the pureblood horse ineluctably points out man’s own shortcomings. 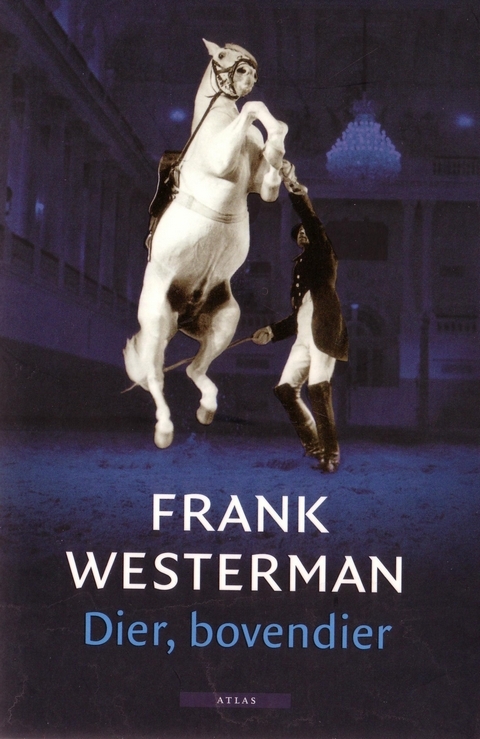 „Frank Westerman paints a huge impressionistic landscape of Europe, in which the history of the lipizzan horse is described against the background of the great schisms of modern times: communism versus capitalism, nature versus nurture.' 'A masterpiece.“ - Manu Tassier, Best Book of 2010, De Standaard.